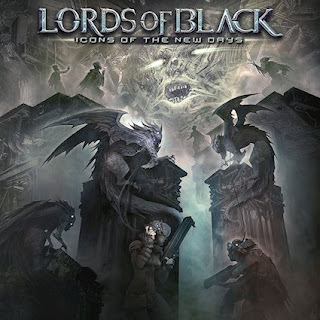 Melodic metal super-group of Lords Of Black are back with their brand new opus with the title "Icons Of The New Days" through Frontiers Music this May. The band consists of vocalist Ronnie Romero, renowned guitarist Tony Hernando, drummer Andy C and a member on board, bassist, Dani Criado. The opening tune of "World Gone Mad" will kick some major asses, that's true. This is a huge melodic metal anthem surrounded by some inspired guitar lines, a tight as hell rhythm section and above all Romero's amazing vocals! Ronnie Romero is without any doubt one of the most talented and powerful vocalists out there!! The darker and groovier "Icons Of The New Days" reminded me a bit of Allen/Lande's works while in "The Way I'll Remember" we are dealing with a killer track. Melodic, powerful and heavy this song is pure gold. Romero's vocals are out of this world and together with these superb and tight arrangements they compose one of the new record's highlights. The technical, with it's progressive pinches, "Fallin'" is brilliant and the heavy "Long Way Down" is among my personal favorites. The chorus line here is catchy as hell and this particular song must be played on maximum volume. Check out also, the fast-paced and in-your-face tune of "Wait No Prayers For The Dying" and the prog monster "All I Have Left" which closes this new opus in a very impressive way. Very impressive album! "Icons Of the New Days" should be Lords Of Black ticket for a wider recognition, for a bigger audience. It's a true melodic metal/hard rock monster that's gettin' better and better and bigger with each listening.